GOP Congresswoman Martha McSally Confronts the Sexist Capitol Hill Dress Code. 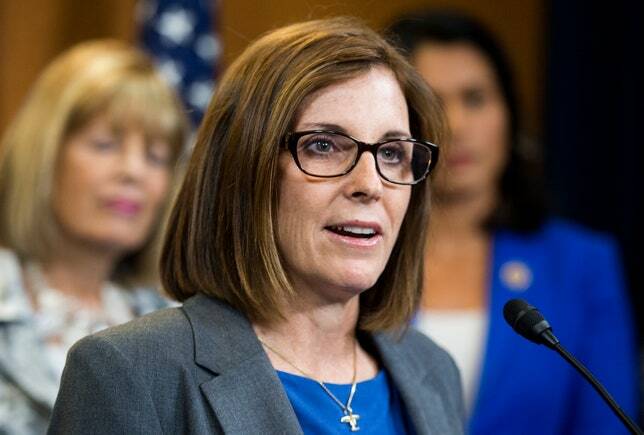 U.S. Representative Martha McSally (R–Ariz.) was on the floor of the House of Representatives on Wednesday morning discussing first responders in her district when she shifted the conversation to a topic that has come under fire in recent days: the unspoken dress code on Capitol Hill. Earlier this month, CBS News published a report on the sartorial guidelines that dictate what falls under “appropriate attire” for men and women in both the House Chambers and Speaker’s Lobby (a small room situated next to the House Chambers where reporters often wait to ask questions). Women must have a sleeved dress or blouse and wear closed-toed shoes, while men are required to wear a tie and suit jacket. Men have been forced to adhere to the dress code—sometimes borrowing “ties of shame” to make sure they’re up to snuff. But when reporter Haley Byrd was recently passing through the Speaker’s Lobby—and wearing a sleeveless dress—she says she was ousted from the building because of her choice of clothing. McSally is no stranger to confronting dress codes—in 2002, while serving as a fighter pilot in the U.S. Air Force, she sued former Secretary of Defense Donald Rumsfeld over a military rule mandating that women wear an abaya when traveling off base. (McSally argued that the rule was unconstitutional because men were not required to adhere to “host nation attire”). And on Wednesday, she directly addressed the recent reports that women’s choice of attire has been under increased scrutiny lately.